Welcome to part two of our road trip around rural England. We hope you didn’t get too cosy exploring the south, paddling in warm seas and living the good life because we’re about to take things up a notch. Normally if we plan a weekend away, we head north. There’s no reason for it other than we just seem to find somewhere new and epic to go and as keen hikers, we’re spoiled for choice. Northern England is wild, rugged and free. The land is as earthy as the people and it’s their hospitality that sets the North apart from the South because, in our experience, it’s genuine. And we’re not talking about customer service, which is usually pretty good wherever you go in England; we’re talking about the people you meet in the pub or out and about. Northern hospitality is second to none. So, let’s hit the road. We’re heading back to the East Midlands for leg nine as we climb north-east into England’s Peak District National Park. This is Last of the Summer Wine country and at times you could be forgiven for thinking you’ve stumbled through time into days gone by because the hills and dales are the way they’ve been for centuries, thanks to careful land management and respect for the ancient history of the surroundings. For example, the Arbor Low stone circle near the A515 has been on farmland in the Peaks since Neolithic times and is the most important prehistoric site in the East Midlands. At this time of year (March) Wild Garlic is about to bloom and the Peaks are covered in it so make time for some foraging along your journey. We chose Bakewell for one reason alone. The world-famous Bakewell pudding. Put down your Mr Kipling. Once you’ve tried a proper Bakewell pudding, life as you know it will never be the same. Ok, it’s time to move on from chocolate box England because this is where things are going to get interesting. Although we’ve dabbled in the beauty of northern England and basked in its glory, gone are the darling villages and thatched cottages. We’re taking you further North where the rugged landscape drops away and you’re left with miles and miles of wild and wonderful England. If you haven’t driven the Snake Pass from Sheffield to Manchester across the northern Peak District before, you’re in for a treat. We vividly remember the first time we drove along it. No one had told us just how dramatically the landscape would change and Megan nearly launched herself out of the car as she tried to get a grasp of what she was looking at. And that’s just the beginning, as this leg of the journey, which while trundling from one National Park to the other, ends on the edge of the Yorkshire Dales, where once again you’ll be taken out of your comfort zone and awed by the incredible diversity of the English landscape. And that’s just by doing the Ingleton Waterfalls Trail. Trust us, you don’t want to miss it. The walk is four-and-a-half miles but by the end of it you’ll have witnessed the incredible power of England’s landscape. Some legs of this road trip have been about the destination, but this one is very much about the journey (and also the destination). Give yourself time for this one because if the Peaks and Dales impressed you, as our friend Fay likes to put it “the Lake District is the Peak District on steroids”. And it may look like a shorter leg but it's windy. Plus, you have to make a gingerbread stop in Grasmere. It's the law. There are high roads and low roads across the Lakes which give way to very high roads and sheer drops, so again if you’re not a fan of heights, try and take the more direct approach (there is one, we promise) . Looking at the map, this is a bizarre way to get from A to B but “as the crow flies” isn’t a term you can use lightly in the Lakes. And as the next leg is a long one, we thought we’d make the most of this; our favourite journey in England. And once again, it's hard to describe without sounding too cheesy, so here’s a (rubbish) video I shot in 2015 to show you just what to expect from the drive to Buttermere. Once you get there , take the route up the steps and through the woods because, while it’s no Scafel Pike, the walk is tough enough and the views are incredible. We're excited about this leg of the journey and here’s why. Below is an English Heritage map of the area and as you can see there’s a straight line across the north of England, Hadrian’s Wall. 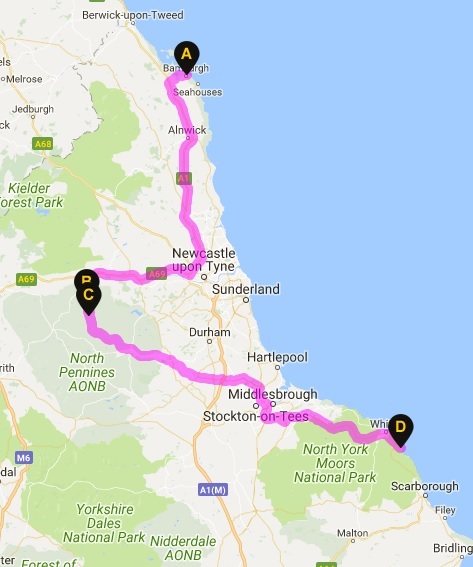 We’re going coast to coast across the wall and up to Bamburgh Castle in Northumberland; as close to Scotland as we’re going to get on this trip. If you’re not an English Heritage member, there’s a parking pass you can buy along Hadrian’s Wall which allows you to stop at certain places en route and we’d highly recommend buying one as a few of the stops are only very short but give you a glimpse into Roman England and what was once the great garrison of the north. It’s an incredible feeling to stand on one side of the wall and look across to the other, knowing the years of labour that went into building it centuries ago. In fact, the cover photo for this article was taken on Hadrian's Wall in 2016. Once you reach Bamburgh Castle, you’ll have made it to the most northerly point of the journey, so enjoy the moment as you stand on a piece of volcanic rock that forms the raw foundations of the British Isles, because we’re heading back down south, but the trip is far from over. The East coast of England is pretty awesome, wherever you stop along it. Tales of smugglers, Vikings and storm battered shipwrecks follow you down the shore. The reason being the North Pennines, which is another AONB that it’d be criminal to miss on a trip across rural England. In a similar way to the south west coast, if you manage to drive through it without stopping at least once to say “wow” then you’re on the wrong road trip. And like the south coast, photos cannot do it justice. They just don’t capture the vastness and even loneliness of the place. And we’re heading into the North York Moors next, so that’s quite a statement. Because the next stop is Robin Hood’s Bay, just south of Whitby, which starts high on a cliff and sweeps down to the cove and it feels like nothing has changed for 100 years or more. And it’s there you’ll get the best fish and chips of the trip. It's time to head for the Humber as we continue south through Yorkshire and into Lincolnshire. This part of the East Midlands is often not on the tourist routes, so is quiet and incredibly underrated. The Lincolnshire Wolds AONB is teeming with wildlife all year round and is one of the few places we’d seek out in the Autumn/Winter because it’s when the seal pups are born on land. The coast from the Wolds and back around to the Wash, near where we started this road trip attracts a vast array of bird life and there are a number of RSPB reserves from Lincolnshire to Norfolk where you can stop and spend a few quiet hours watching birds that come back to the area every year. It’s time to head home and back to our little shire of Rutland. We’ll often fly the Rutland flag on the Rural Travel Guide as not only are we born and raised Raddlemen, we have chosen to stay here and often have to pinch ourselves as to how lucky we are to live in such a beautiful area. Not that we appreciated it in our teens. 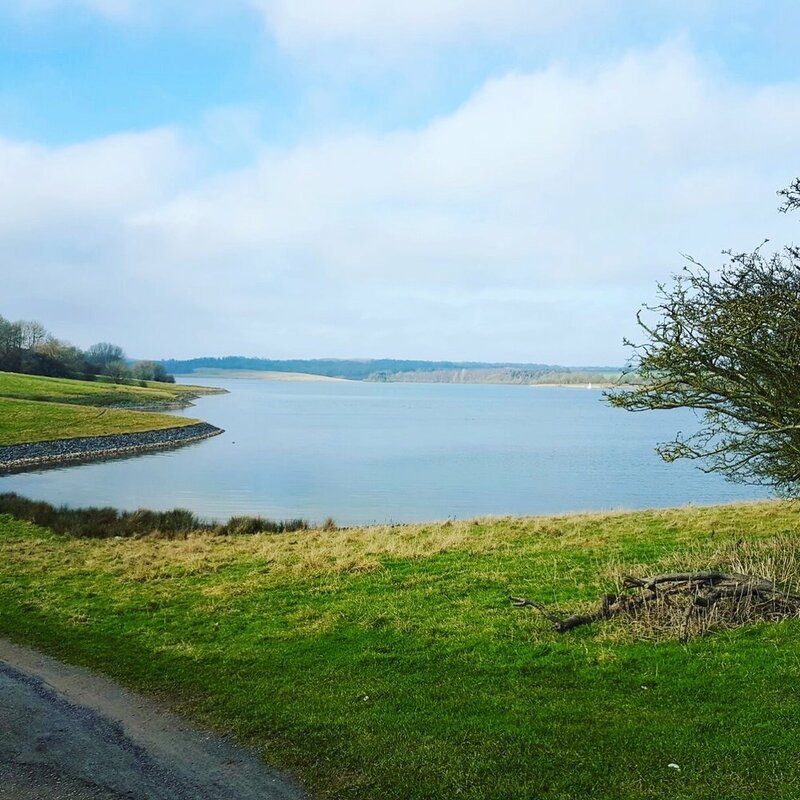 We honestly think Rutland is a culmination of everything we love about England: rolling hills, picturesque farmland, rare wildlife, great food and drink and in the middle of it all, Rutland Water which is a hive of watersports and recreation. It might not have that same breathtaking scenery as some of the places we’ve visited on this road trip but it gets under your skin. So next time you’re passing through, don’t. We hope you’ve enjoyed our rural road trip around England and that we’ve opened your eyes to places you’ve yet to discover. We’ve certainly identified a few gaps in our own itinerary, starting with the Isle of Wight which is on the cards next week. Follow us on Instagram to watch our stories as we explore the best of rural Britain.